and a panel discussion on human trafficking. Melisa Tien will be developing this important work on the human trafficking of women. Melisa is a member of New Dramatists and is a fellow of the New York Foundation for the Arts in Playwriting/ Screenwriting. A developmental reading of the play will be presented in the Spring of 2019 at New Dramatists. DISTANT SURVIVORS has been published by Blue Moon Plays. Obtain a copy and inquire about productions. Distant Survivors is adapted from the Holocaust poetry of William Heyen, and has received humbling testimonials from audiences. Its honorary committee includes Susan Sarandon, actor and activist. 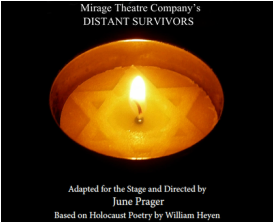 Conceived and adapted for the stage by director June Prager, Distant Survivors is based on Holocaust poetry by William Heyen. The play explores man's attempt to fathom the evil that spurred the Holocaust and confronts the condition in mankind that allowed it to happen. Irish playwright Gardner McKay’s romantic comedy predates email, cell phones, and Match.com; it’s a world of slow mail and slow courtship. It’s about personal identity and how technology, ambition, and city life has affected the quality of life for most of us. CEDARS is a passionate and raw play- based on contemporary Native American poetry. It offers insight into the world of diverse indigenous peoples and their everyday struggles, but also offering glimpses of hope, celebration, resistance and the beauty of indigenous cultures.